Kudos to Louisiana Progress for the image. 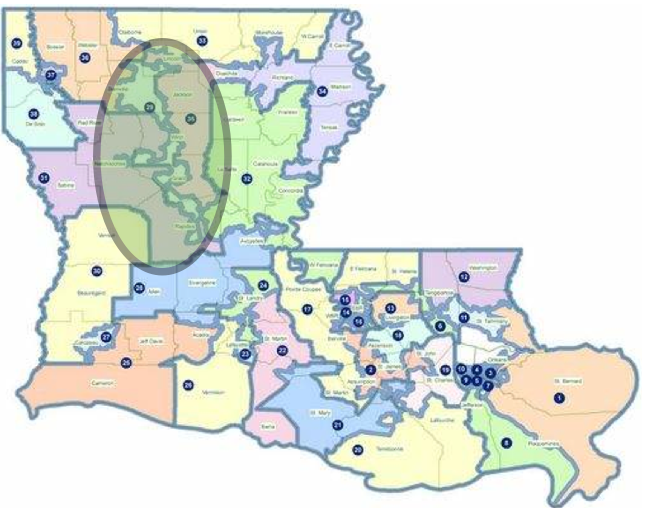 Under the plan approved by Chaisson and his committee, Alexandria and Rapides Parish would be gutted, ostensibly to create a serpentine-shaped “majority-minority” district. It’s absurdly unfair, blatantly political, and against the spirit of a representative democracy. Rapides Parish should not be gutted. 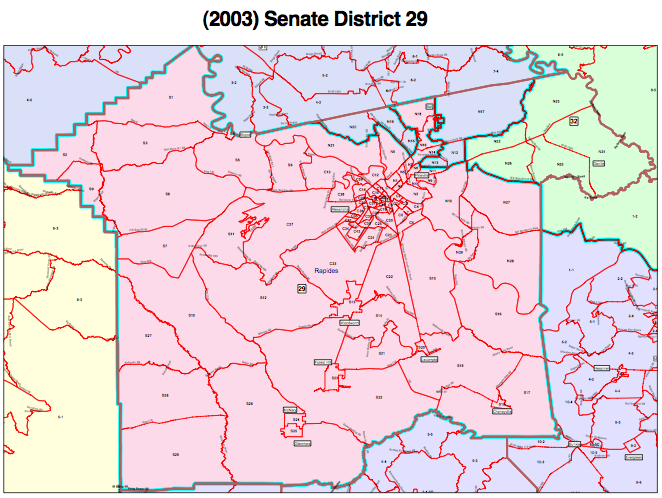 There is no compelling reason, for example, to split representation between England Air Park and the City of Alexandria, and there’s absolutely no reason to reshape Senate District 29 into order to create a poorly-drawn “majority minority” district, particularly considering the exponential growth of minority populations within the boundaries of the current district (97% increase in Hispanics, 10% increase in African-Americans, and 1% decrease in caucasians). It’s the latest incarnation of the Zorro district, an attempt to carve out a population center and disingenuously dilute representation under the guise of fair representation. What is occurring right now is anything but fair. Monroe has been outspoken: they won’t be carved like a Thanksgiving turkey; they won’t give up their position as a “population center” for a seat in the United States Congress; if anything, they should be allowed to increase their representation. Of course, it helps that Bob Kostelka, the former judge turned State Senator, is from Monroe. Senator Kostelka has attempted to set the tone with his redistricting plans, and despite Governor Jindal’s recent pandering on the Kostelka Plan, Monroe is somehow protected. Central Louisiana experienced a surge in population during the last ten years. Aside from Bossier City, Alexandria has been the fastest-growing city in northern and central Louisiana. Monroe and the Greater Monroe area, however, have experienced significant population decreases, approaching percentiles in the double digits. Today, for the first time in decades, Alexandria is nearly equal in population with Monroe, and without any doubt, Alexandria serves a much larger area than Monroe. Yet Alexandria is somehow on the chopping block, and before any plan even hits his desk, Governor Jindal has already made it clear that he supports vertical and not horizontal Congressional districts in Northern Louisiana. No one really minds the notion of an I-20 Congressional district, except for entrenched Republicans. We can split up the state evenly and geographically, and we can still adhere to the Voting Rights Act. We have the opportunity to become a more representative democracy. 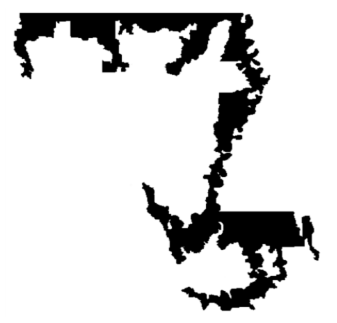 There is no reason for anyone, in any part of Louisiana, to believe in Zorro districts. We’re better than that. If, for some reason, the Governor signs this plan into law, it will surely be the subject of inquiry by the Department of Justice and could also likely be the subject of protracted litigation, which would expose Louisiana taxpayers to financial liability. Can we just get it right the first time? Is that too much to ask? I guess it’s easy to dismiss redistricting efforts when Republicans control the legislature, and, ultimately, the process. I know you’re a little young, but few progressives harped about the old, unconstitutional 4th district, which was just as bad. It’s the garbage in/garbage out principle: the faulty assumption that a white representative cannot adequately represent non-white constituents. When districts are drawn like this, I think it dilutes, rather than strengthens, minority vote. If there is a relatively color-blind sense of community, then minorites in Shreveport would be better served by a white rep from Shreveport, rather than a corrupt minority politician from Baton Rouge (with no apologies to Mr. Fields). If we draw districts that are reasonably compact, respect the local needs of communities, and, whenever possible, keeps those communities intact for voting purposes, the “color” or “gender” or background of the elected rep should mean less in the long run than the content of that rep’s character. Not to pat ourselves on the back, but the last two Louisiana gubernatorial winners included a female and a second generation American of Indian ancestry. As far back as 1988, Jesse Jackson received Louisiana’s delegates at the Democratic nominating convention. While I think they were never correct, I believe strongly that the majority-minority district concept has outlived whatever usefulness it might have had. Rapides Parish might have to be lumped in with Monroe or Lake Charles, but I agree with your basic proposition that we should be intact.